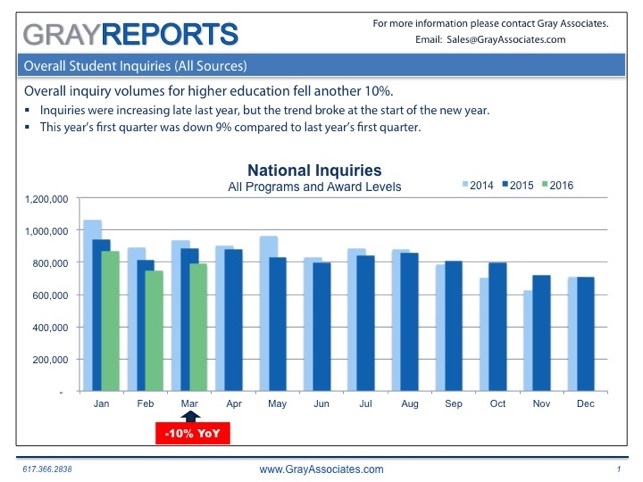 EDU Demand Trends is education specific content provided by Gray Associates that highlights some of the more important trends in the education industry. 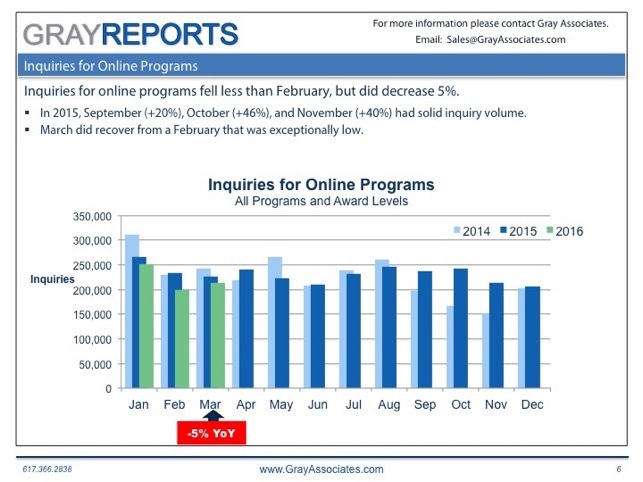 Gray Associates has decades of functional experience in strategy, cost reduction, marketing, channels, and customer research. The 2015 Survey of Online Learning conducted by the Babson Survey Research Group and co-sponsored by the Online Learning Consortium (OLC), Pearson, StudyPortals, WCET and Tyton Partners, is the leading barometer of online learning in the United States. 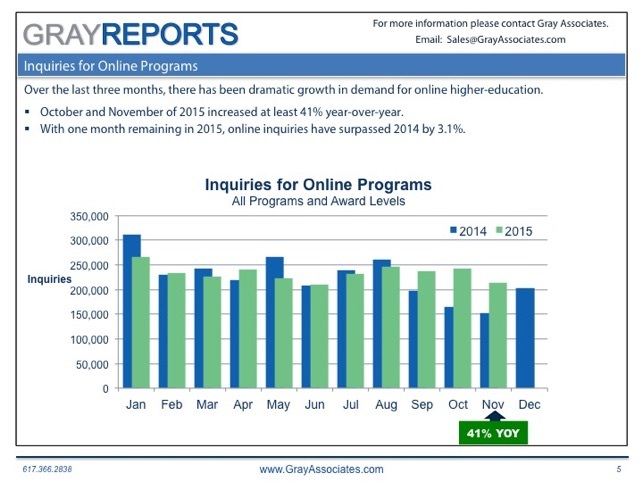 A year‐to‐year 3.9% increase in the number of distance education students, up from the 3.7% rate recorded last year. More than one in four students (28%) now take at least one distance education course (a total of 5,828,826 students, a year‐to‐year increase of 217,275). 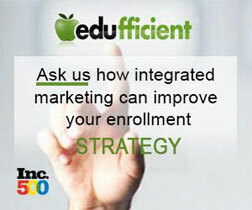 The total of 5.8 million fall 2014 distance education students is composed of 2.85 million taking all of their courses at a distance and 2.97 million taking some, but not all, distance courses. Public institutions command the largest portion of distance education students, with 72.7% of all undergraduate and 38.7% of all graduate‐level distance students. The proportion of chief academic leaders that say online learning is critical to their long‐ term strategy fell from 70.8% last year to 63.3% this year. The percent of academic leaders rating the learning outcomes in online education as the same or superior to those in face‐to‐face instruction is now at 71.4%. Only 29.1% of academic leaders report that their faculty accept the “value and legitimacy of online education.” Among schools with the largest distance enrollments, 60.1% report faculty acceptance while only 11.6% of the schools with no distance enrollments do so. 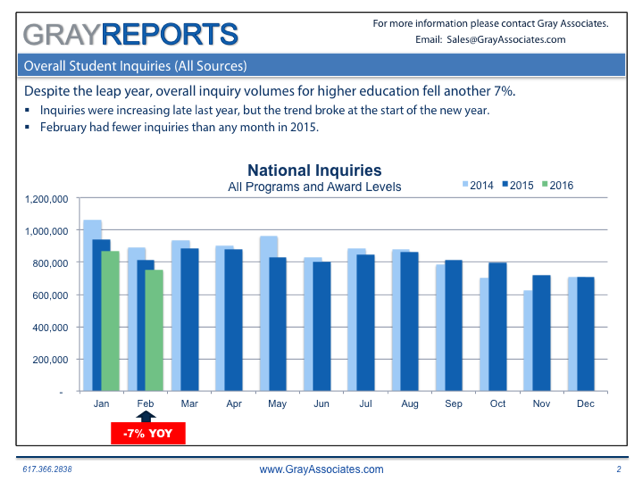 Q1 2016 Student Inquiries for Higher Education Finished 9% Below 2015. 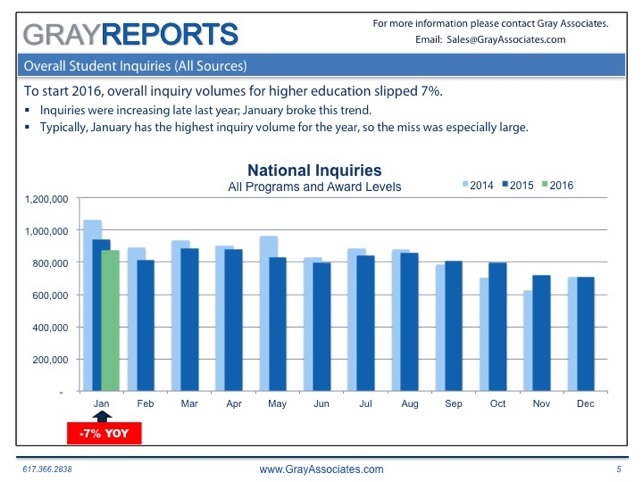 Back-to-Back 7% Declines in Student Demand for Higher Education. 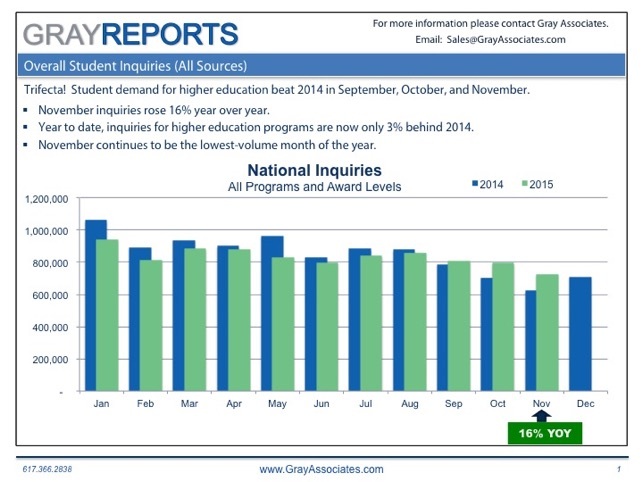 Demand Downer: 7% Decline in Student Demand for All Academic Programs and Award Levels. 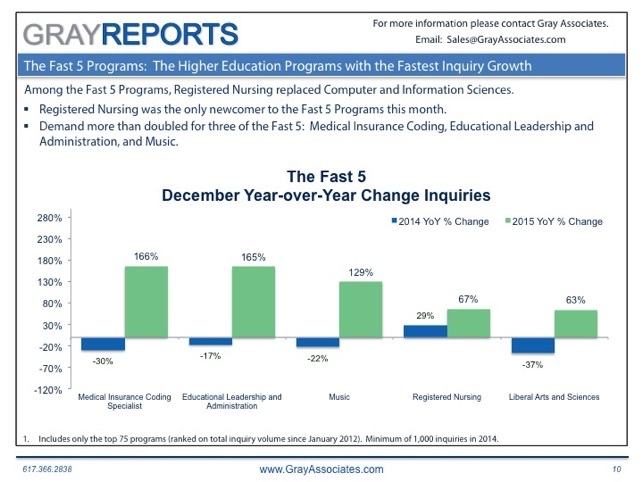 Among All Large Programs, Medical Insurance Coding Realized the Largest Year-Over-Year Inquiry Growth in December of 2015. 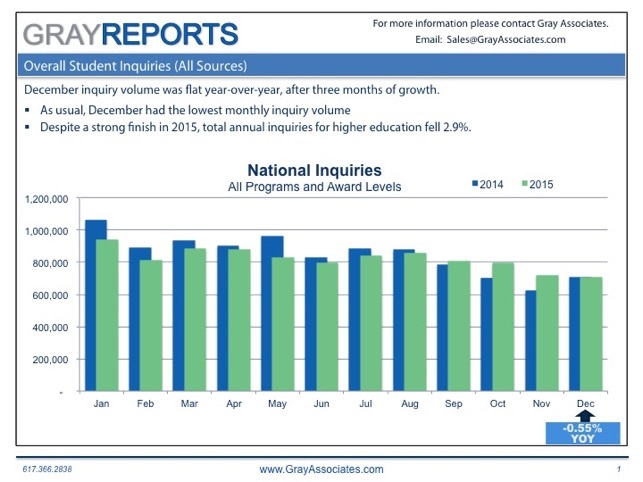 For the Third Consecutive Month, Student Demand for Higher Education Exceeds 2014 Levels. It’s up! 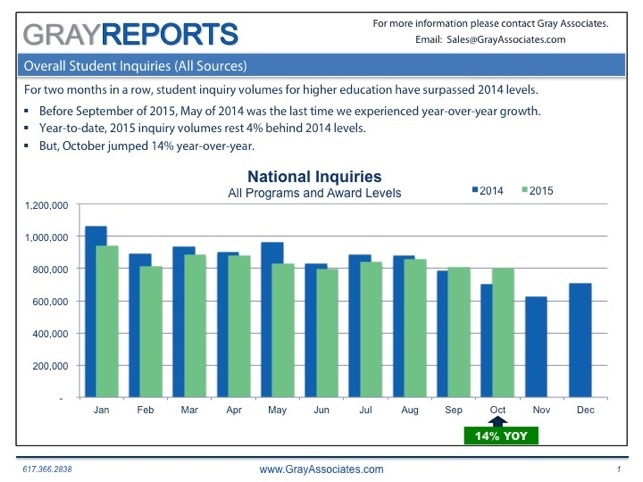 Student Demand for Higher Education rises 14% in October of 2015.